A makeup primer is a lightweight product designed to create a base on which you apply your makeup and helps keep makeup looking fresher for longer. When we paint a wall, we use an undercoat or primer to create an even base to put the main colour on – a makeup primer does the same thing – prepares the surface for a better, longer-lasting top coat! The main purpose of using a makeup primer is to help makeup last longer and stay fresher looking by reducing the chance of streaks, creasing and fading. Even out skin texture and reduce the appearance of pores and fine lines, providing a smooth base on which you apply your foundation. Removing excess shine from the skin (look for “matte” or “mattifying” on the packaging). SPF (sun protection factor) element. Even out skin tone – some primers have a slight tint to them, or come in a corrective shade (e.g. lilac or green) to even out minor pigmentation variations. When Do I Apply a Primer? A primer, whatever the brand or formula, is applied after cleansing, toning, moisturising and applying sunscreen, but before applying any of your makeup. Allow moisturiser and sunscreen to really soak in and for skin to be “touch dry” before applying primer. Primer is not to be confused with moisturiser – even if it has a hydrating property, primers have a different purpose to moisturiser. You do not powder a primer. Simply apply it and then put on your makeup as normal. The main types of primer on the market are foundation primer and eye primer. You can also get lip primer (a colour-free base coat for lips) and lash primer (a base coat for mascara). Foundation primers come mainly in liquid or gel formulations. Some go to a soft powdery finish. Comes in small bottles or tubes. Tend to be clear, though some products have a slight tint or come in a corrective shade (like lilac or green) to even out minor skin tone differences. Some primers are made to go under certain types of foundation or for a particular skin type. 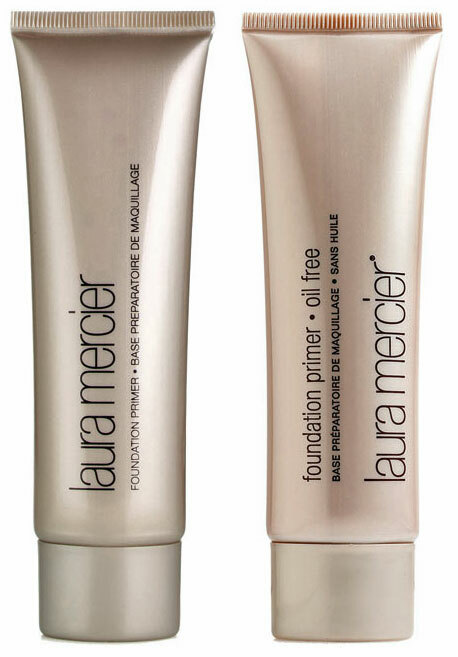 Primers can be added to a thicker foundation product, creating a more sheer foundation coverage. Application: Apply primer before foundation. A tiny amount covers the whole face (pea-sized blob). Apply with fingers or a medium flat brush (like a foundation brush). For using on the eyelid and upper eye area. Helps eye shadow, especially powders, adhere to your skin better. Locks eye shadow colour in, making it more colour-true and intense. Helps prevent creasing, fading and smudging. Eyelids can be quite oily, and it’s the oil (along with eye movement like blinking) that contributes to that annoying creasing, or causes eye shadow to fade/move. Eye primers tend to have pigment in them to even out the eye area skin tone to get a consistent base on which to apply your eye colours. Eye primers come in liquid form (in small tubes) or as a cream in a pot. Application: You only need a tiny amount to cover the eyelid area (like the size of a grain of rice). Use a small flat brush to apply to the whole upper eye area. A colourless product that provides a smooth foundation for your lipstick or gloss. Helps the lip colour apply smoother, be more colour-true and last longer. Helps to prevent feathering, creasing and smudging. Helps prevent lips drying out, something often associated with long-lasting lip colour. Can help prevent lip colour staining the lips. Application:Lip primers come in either stick form in a tube (just like a lipstick) or with a small applicator (like gloss). You simply apply a thin layer to your lips. There are also lip primer pencils which are designed to line the edge of the lips to prevent bleeding. A base coat for eyelashes, designed to be worn under mascara. Lash primer can help protect lashes, add length and volume. Can make coloured mascaras stand out more. Helps prevent mascara from smudging and flaking off. Some people find having a primer on makes removing the mascara easier. Application:Comes in a tube with a wand and is applied just like mascara, but use sparingly. Allow it to dry before apply mascara. Often white in colour, though some products dry to a semi-clear colour. Left: no eye primer. Right: with eye primer. We think they do. As pros, we often use foundation and eye primers when working, as filming conditions really test the makeup and it often has to last all day. Also for bridal work primers are great, helping to keep the bride looking fresher for the day, often under a little duress! We did a quick non-scientific experiment with Cinema Secrets eye primer. 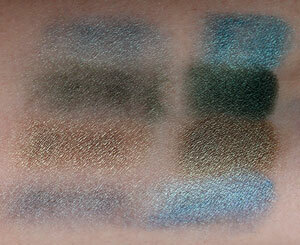 The picture shows the same eye shadow colours applied with and without eye primer. With primer, the colour is grabbed quickly and looks more intense (on the right). The colours on the non-primed skin (left) look more wishy-washy and would take more time and effort to get as intense as the right side. We didn’t apply more product to the primed right side – the primer simply grabs the eye shadow really quickly and nothing is wasted! Primers come for all skin types. While many primers can go on anyone, some foundation primers are designed for specific skin types, or simply work better for a certain skin type. For example, an oily skin may prefer a foundation primer with a mattifying finish or oil control aspect. Those with drier skins may prefer a primer that provides hydration or leaves a more natural/dewy finish. Fragrance-free formulations are better for sensitive skins.